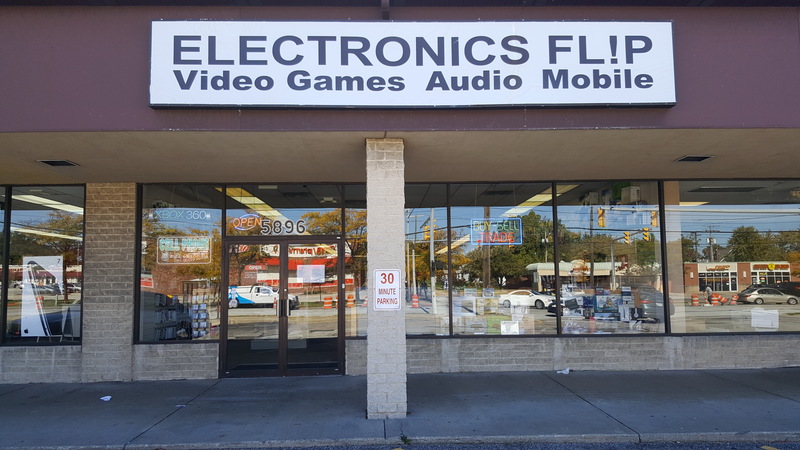 Electronics Flip Your place for bargain electronics and video games! 4/10/19 - Check out our updated Pre-Orders list! 12/17/18 - We have revised holiday hours, opening at 9 AM until 12/25! We'll be open from 9 AM to 6 PM on 12/24, closed on 12/25, open regular hours (10 to 9) on 12/31, and closed on 1/1. 6/14/18 - The page for pre-order video games has been updated with new E3 games! Click above to check out our new offerings. 5/3/18 - Check out our new selection of artwork! We got new Mario, Zelda, Samus, and other classic game characters" Artworks. These make great gifts for Mother's Day! 11/22/17 - We are open early Black Friday at 9AM. We'll be open early 9AM til December 24th. 9/14/17 - Check out our new section exclusively for gamers, updated monthly with news, reviews, and cool trivia! See "Gamer Stuff" page above! 9/13/17 - We now offer controller knob repair, stop by today! 6/4/17 - Stop by and check out some unique items we just got in our store! These make great gifts for Father's Day, Birthdays and Graduations! 10/7/16 - We now accept board games for trade, bring us your board games today! 7/18/16 - We now take pre-order! Stop by and pre order a game today, see pre-order page above. Welcome to ElectronicsFlip.com! We specialize in new and used electronics. Our inventory includes video gaming, mobile devices and accessories; home and car entertainment; a large variety of media; tablets; laptops and so much more. Check out our website or store for our unique daily changing stock. Want to be the first to learn about our newest additions, or looking for something special? Sign up for our email by emailing us at support@electronicsflip.com. Below is a chart of typical prices we charge for various brands of iPhone and iPad. Please understand that this is just a simple standard price for ONLY a digitizer/LCD replacement on these devices, and that the quoted price can change due to either cosmetic damage or any add-on service that might be required. We also repair other types of phones, so please bring yours in to the store for a quote. Note: We no longer repair iPhone 4, iPhone 4s, or iPad 1st generation. For those, please ask us the price to buy a replacement. Monday-Saturday 10:00 a.m. to 9:00 p.m.